This will be no surprise to many of you but perhaps my experience will be useful for those who haven’t taken the plunge of in house production. If you need to catch up, previous entries are pt.1, pt.2 and pt.3. With respect to how your shop is set up, there’s a critical difference between sewing one-offs vs analyzing your set up for potentially making a bunch of a given item. There’s problems I’ll put up with for a one off but I won’t do it for a quantity. In spite of having what many would consider an optimal shop, here are some problems I would have with my project if I made any quantities. My table is not high enough for proper cutting. We’ve never gotten around to getting car jacks and long pieces of lumber to raise this 20 foot section of table to the proper height. It will be a lot of hassle to do it and we’ll have to buy some more jacks for something we won’t need to do often. Maybe we could rent them? My back is killing me. I sewed both 4213/4214 on my Adler -which I love- but it’s not a long term solution for either velvet or leather. Digressing to the status of the former leather style, I have a walking foot in my garage that I have to move over here and clean it up. I don’t know about you but I hate fiddling with new-to-me machines (this was a donation, older machine but it works great). The Adler doesn’t like velvet either. Does any machine? I suspect I will need to acquire a needle feed machine for velvet. The Juki DLN-9010 seems highly rated. Does anyone have a better suggestion? I tell you, through out the process of sewing these protos I kept asking myself why I liked to sew. Do I? I began to wonder about that. I had to hand baste the lining to the bag opening before I could sew it officially. I didn’t seem to have the same problem sewing velvet to velvet although there was a bit of creep. I use to sew a lot of velvet, how did I do that? Oh right. I did it on the home machine with a walking foot. The black velvet 4214 takes a whole lot of nail heads. I don’t have a kick press or the dies to apply them. On the prototype, I set all of these by hand. This means poking it through the fabric and turning back each of the four legs by hand with a pair of jeweler’s pliers. In the normal course of affairs, you’d do two things. First is to produce the prototype and solicit orders. At the same time, you source the machine you’d need to do this cost effectively. I’ve been meaning to buy one of these forever but I never have. On the plus side, I’d be able to attach nail heads to leather. As it is, product price really can’t be determined until you actually have the machine but you do the best you can. I estimate applying all these nail heads (around 250) will be about 30 minutes as compared to hours and hours by hand because I’ve used a kick press plenty of times. Anyway, when you source the machine, you have to inquire as to turn around on delivery so you can estimate delivery date of the goods. I have a friend who sells these and I found another source (linked above). My friend can probably get me a better price but then he’s farther so shipping will cost more and transit time will be longer. Ordering from Hiker would affect delivery in a week, don’t know how long for my friend. The second thing to source are the dies to apply them. Usually you get dies from the folks who made the nail heads. I bought these nail heads at auction but I know who makes an identical product. I can’t get a delivery time on dies because they’re still closed for the Independence Day holiday. Lastly, you have to estimate the costs of replenishment. I’d have to buy an awfully huge box of these to get a decent wholesale price but I did find a retail source that are rather pricey ($6.99 per gross X 2 gross per unit) but will do in a pinch. In short, in spite of this being velvet rather than lamb, this bag could actually cost more once embellishments and labor are factored into the equation. Apparently I cannot run my boiler iron, air conditioner and Adler all at the same time. Frankly, I’m a bit miffed about the latter. Olga (my landlady)’s ex-husband (Martin) supposedly set up the Adler on it’s own circuit. She is not going to be pleased when I tell her the circuit trips. I think Martin does work for Olga in trade for child support or something. None of us can imagine why she ever married him but Eric (my husband) teases her, saying he knows why she married him but that requires hand gestures I can’t print and should have had the good taste to omit from mentioning. But I digress. The process I’ve sacrificed in the interests of electrical, leasing and ex-spousal harmony is pressing. The fastest but only short term solution is moving my pressing station to the opposite side of the shop. It’s only about 50 feet away but it’s not a straight path. I have to circumvent my desk, plotter and shipping station and move the microwave oven on the table somewhere else because it’s hogging the space. That also means installing another outlet. Moving the pressing station also means I’ll have to be neater. Most horizontal surfaces in here -including the floor- are used to store “stuff”. ~sigh~ I think my only solution is a really good fire. With all the lights in here, I can’t believe I still don’t have enough but I don’t. Lights over the table are fine. It’s the sewing area that needs more lighting. The ceiling in here is a bit dicey so I hate poking anything through the panels. It’s one thing to have a shop set up to do prototypes you only have to wing once (which is all I usually do), versus setting up to do longer runs. If you’re thinking of doing this, in the course of sewing prototypes, you should write down any things that bother you because those will become major annoyances later. For example, I’ve already sacrificed pressing. I have to turn off the air conditioner to do it meaning I’ll only do it early in the day. Once you figure out what needs to be done or purchased, you have to calculate the costs, space requirements and the time in which to do it. I realize not everyone is fortunate enough to have the resources and space to make this happen. The point is, even with money, space and time, this is still a hassle. If I apply myself, I should be able to get the shop reconfigured in two weeks which would include machine delivery time and labor on weekends. I also don’t look forward to shuffling things around in here. There’s still two big ifs. One is for Martin to fix my electrical service but we could do that ourselves if we had to but then that would be three weeks out. The second unknown is what sort of machine to sew the velvet, buy it, another to apply nail heads and at this point, I’m thinking I’d love a new walking foot with all the electronic gadgetry. There’s time needed to arrange for delivery and to set it up. There’s also some equipment I’m interested in for yet another style, one with fringe. I’m submitting a quote for a custom die today. Who knows what that will cost? Looking at this the worst way possible, this is all equipment I have wanted and could use but never got around to doing it because of all the work involved. Not having this set up has certainly limited the sort of work I do even within my own specialty. I think another reason for reticence is getting it all set up and then not doing anything with it. Then last of all is thread, another thing I don’t have. Where am I going to buy that? I normally only need to find things for designers in quantity, not onesies and twosies for myself. I sew most everything in either taupe, blue or red thread. And then I’ll need a better way to store it than throwing it in a box like I do now. It’s not even a box anymore, the bottom fell out. Luckily for me, the box was in the laundry cart when I tried to lift it out so now the laundry cart is full of ugly too-heavy thread that my Adler doesn’t like that I don’t have the heart to throw away. The laundry cart is next to a big box of separating zippers that I also can’t get rid of. I tell you, I need a good fire. As is becoming increasingly redundant, inventory can strangle you and having the storage in which to put it only encourages you to do your worst. And in my case, that’s pretty bad. I know I can FreeCycle it but the local group seems to be comprised of opportunists who just want whatever they can sell at a garage sale. I even have a good serger I don’t need anymore that I tried to give to a not for profit sewing co-op but they don’t return phone calls. It seems that all I do is complain and complain which is strange because I’m a naturally cheerful optimistic person (I am, really). You make me laugh and I can totally see myself. I am attempting to redo my work space this summer too. I had to throw stuff away as it was piling up, but I hated doing it. Anyway, for the excess thread and zippers, you can sell those on Ebay or Etsy. Etsy allows individuals to sell supplies, so maybe worth a look. Good luck. Doesn’t it seem like one step makes 8 others appear? Selling on Etsy is a great way to move your excess inventory of supplies. Just be careful what lot size you offer. For example, you can put up six or twelve zippers for a price and then put in the description that interested parties can contact you for a larger quantity. You could put off a buyer by only offering large lots of any item. Please do not make me laugh with your post today. I am reading your blog to avoid organizing my work room. Oh, also remember that community colleges, adult community centers and the like might be able to use your cast offs. We are often given fabric and zippers and patterns, etc. Sometimes we receive things from industry but even individuals have now given us their fabric stashes when they are getting ready to move or finally face the fact that they will never sew all that fabric!!! In your sewing area, some clip-on halogen work lights might be effective. I have mine attached to a floor-to-ceiling pole and I can easily adjust the lights by clipping them at different heights on the pole, aiming them where I want, or even moving the pole to suit my needs. They also have the advantage of being relatively inexpensive. I’ve been sewing on top a former chemistry lab bench made of heavy oak with shallow drawers in front. To perch on the lab stool at a good height for the serger, my thighs would mash up into the drawer support. Today I pulled out the drawer and used a hacksaw to cut off the support. Much better! Later, I read this post and can testify to the wisdom of analyzing what bugs you and fixing it. I also have bags of really nice “stuff” that I’m not going to use. I’ve been meaning to sell the stuff for ages, but even listing on Etsy takes time. When you’re trying to get product made, it’s hard to justify taking that much time to try and recoup a few pennies. On the other hand, you are right about stuff sitting and being in the way. I’m sure it contributes to negative energy and generates complaining. Another aspect to this that I’m sure you’ll address is how same idea applies to the product itself. You’ve been in production Kathleen, so you’re probably already analyzing your product from the get-go. I started by designing the best functioning product I could come up with and it has sold well, but I had been making them one at a time. The bummer is that for production in quantity it’s a real pain to make. I’ve been trying to re-work it to sew faster and easier without sacrificing function or look, so that I can transition to the new way rather than having to re-introduce it as a new product. I would raise your table or get a higher one. Last year, I was making some dresses at home on a dinner table. I woke up one day, and just couldn’t get off of bed because my back was aching so much. My boyfriend had to take me to the hospital. So take this as a cautionary tale. Have you tried a teflon foot on the velvet? Also, I know high school home ec classes (where they still exist) or local trade schools are always looking for donations. Tee Hee! Now I don’t feel so guilty. I’m trying to work through my fabric/thread/zipper/stuff but its hard. I share my sewing area with the laundry room and the cutting table is the dining room table. I envy your setup. The leather bag turned out well; very clean and simple. I’m not sold on the studded velvet one but that’s more style preference. On another note, if your AC is a wall unit you shouldn’t be running anything else on that circuit. If it’s an AC system you may need to look at your electrical service and see if you have enough capacity. What’s the amperage rating on your panel? And do you have a dedicated panel. Figuring out the calcs for a workshop isn’t too hard but you need to know the power requirements of the equipment you are using or anticipating using in the future. I know it’s nerd stuff but pull out the installation specs on your boiler. What is the recommneded circuit.? You probably have single phase power coming into your panel, two legs of 110 which would give you 220 for things requiring it (ranges, AC, hot water htr, dryer, whatever). The panel also has to be balanced so you don’t overload one leg. Give me a holler if you need someone to talk electrical and if I don’t know I’ll call my electrician who taught me. Velvet. . .I’ve heard that fusing Steam-A-Seam to the backside helps to control creep. Teflon foot and walking foot are both possibilities. I have a Brother 1500 which is a home model of an industrial. It’s got “pin feed”. When it’s turned on, a pin rises at the back of the foot on each stitch which graps the fabric to pull it taut. I use it on anything I feel is likely to slip — works pretty well. The machine is about $800-$900. I’m surprised Ken piped in with his motto about working on velvet! I saw you coveting my kick press…I’m surprised it wasn’t gone when you left. The funny thing was, it came with a bunch of other 220 v. machines I bought from a gangster, and I didn’t even know what it did. I thought it might be a snap machine. I had no idea what a die was. So you can imagine me describing it to the grommet guy. I have this machine that looks like it puts snaps on, but I’m not sure. Can it put grommets on? What do you mean there is different sizes? How do I tell what size die is in it? Can you help an idiot? Agreed that the teflon foot is the way to go. They also work great for sewing vinyl, or anything else that has a tendency to creep. Can also cut a strip of fine sandpaper and place it face down under the foot to the right of the seam line to keep fabric with thick pile from creeping. Donations? I belong to a quilt guild, with a wearables offshoot. We would gladly take donations to use to make our charity quilts or to sell at our crafter’s “flea” market. We use the profits from this for supplies for our charity donations (we are a non, or not for profit group, I am not sure which exactly). If anyone wants to send donations please contact me at my email addy. Great article. I always get an education and a chuckle out of your writing Kathleen. I don’t know how much extra height you need on that table but one of the back-to-school supplies I’ve seen at Walmart are bed raisers. They add 6 inches when placed under legs of beds and aren’t very expensive. They might work as a temporary solution. If those aren’t strong enough, other places carry them in heavier weight plastic. My physical therapist taught me a work-around for the low cutting table blues… not suitable for long term use, but it works well when you’ve got to use something for short periods of time. Take a chair without casters (a folding chair with a padded seat works well) and turn it around if you sat in it, you’d be facing away from the table. Stand next to the chair and kneel on it with one knee only, and lean into the back as you work. Switch off knees as you work. Regarding adjusting your table height, you might be interested in looking into this option. DH built my 8ft. cutting table, and we used sawhorse brackets that are sold in pairs. @ $4.29 per pair. See http://www.acehardware.com/product/index.jsp?productId=1288988 with painted 2 x 4’s for the legs and the top brace, He built an I beam for the top but single lengths of 2×4’s should be sufficient. This table is strong and level. If you worry about shifting, you could staple no-slip shelf liner on the bottom of the legs, if you want it to be portable, you could attach locking wheels. The width of the lumber to make the sawhorse can be as wide as desired and you can use as many custom sawhorses as desired to lift your top. The formula for figuring height is included on the cardboard packaging. Rather than 2 brackets per sawhorse for a very wide table buy extra pairs and use 3 brackets instead of just a pair and use 4-5 saw horses for total support. I’d galdy come pick up the serger to take it off your hands. (i have sewed all these years with out one so sad). I’d even do a charity project with it. I had actually though about asking for your help with the patterns, but they are so simple you could probally do it in your sleep. Now, to find someone who would volunteer to hand embroider or smock, now that will be a challenge. To bad you don’t have ribbon and lace cast offs, they would be perfect for this project. But, on to your dilemas…. For your table, I don’t know how much you need to raise it, but have you looked into using a bed lift, that will raise it 7 inches with very little effort on your part. Only requires a trip to Bed, bath, and beyond. They even have fancy wooden ones. (well you might have to order those online from them), but still ….. quick and easy, sometimes a few inches helps. I know many sewers that buy in lots on etsy, and ebay. 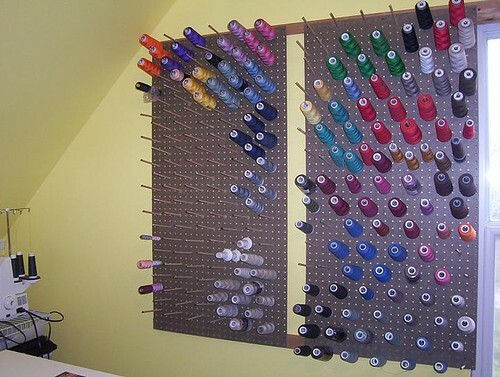 I’ve always wondered what to do with the used thread one doesn’t want anymore. I usally end up giving stuff to someone I know….. I just donated some fabric to the childrens theatre, it had been sitting at the bottom of my closet for years. and my thread sadly i just throw into a box as well, but mines a plastic storage box. Maybe find someone you could bribe to help you organize everything. Find someone that likes to organize, and bribe them with a bag, or a home cooked meal, or you’d be suprised what people will do for pizza! If you can stretch to it, get the Juki – electronic backtack and thread cutter included. I’ve used them before – and I can confirm that they are excellent. Smooth, sturdy and reliable. Makes sewing a pleasure. The sample room of the company where I worked in Italy up until a few years ago was more or less completely Juki and Adler machines. To sew velvet or anything else that’s likely to creep, needle-feed is def the way to go. I learned that the hard way when I was an 18 year old design intern in a factory specialised making fabric accessories. Being a general dogsbody, I did whatever I was asked. This included knocking together the occasional first prototype. Good thing the ‘electrician’ isn’t -your- ex-husband..
That said, I love halogens for sewing, and find them pretty true to the original colors too. But just be careful you’re not looking right into them, or you’ll be burning off parts of your retinas. I have no solution for a higher table except to second Natalia’s advice and tell you to do that first, before you have to be scraped off the floor. As to accumulating stuff because you have room – beware! A friend of mine went through hell when she had to give up her warehouse of 20 years. She had really good stuff in there too. But good stuff is even better when it’s cluttering up other people’s warehouses.. So yes, get in touch with the local quilt guild they usually have long lists of educational/charity gift recipients, and they’ll at least take the stuff off your hands. Ditto for whatever textile educational programs you have around. And I’d recommend eBay rather than etsy. But you know what? If it’s too much hassle or takes too long, it’s still better to hand it to the schmucks who’ll take the time to resell it than to leave it in your own place.. And who knows, the schmucks might actually be nice but enterprising people looking to make a small living honestly :-). Needle feed is my middle name. I have 2 Juki DDL 8300N machines in my now in-operational shop. I would not part with either of them but, here is a link to Miami Sewing. They have thousands of machines in stock and they are selling the 8300N for $600. with the motor, stand, table, the works. Here’s a link:http://www.miamisewing.com/specials/single,doubleneedle&zigzag.htm. There are good images of each machine and you could spend the better part of a day amusing yourself just shopping the site. They are a great resource for special purpose machinery and are very knowledgable and ready to help over the phone. Hi, your post was too good. I saw myself making all the ‘improvements needed as you wrote. I have a ‘shop’ set up in my very small apartment and to juggle everything around can be maddening. I can tell that I’ll need to buy 2 or 3 of everything I use just so I can function and function quickly. Maddness for sure and on-where did I put those…..? My cutting table is a piece of creative genius-if I may say so, but maybe someone can glean from my trial and error solution. I got a metal picnic table at a local trash bash-perfect width 60″ and terrible height. Humm…so after days of just figuring out how expensive it would be to make this $3.95 table work, inspiration came. I went to the Salvation Army to look for sturdy ironing boards and hey, they had one for $1.00!! bingo. I rigged up the table on top of the ironing board (adjustable height) and tied the table to the board. PERFECT height and it is easy to push around. Oh, so many times I’ve had the perfect sewing room but only limited projects and now, as I begin my entry into the world of selling clothing over the web, I have this tiny-dark apartment. BUT, who’s to complain-sewing (for me at least) is recession proof. BTW-did I mention how lucrative sewing alterations for bridal shops are??? thanks for being listed when I Googled-sewing rooms-I am desperate to augment my FIT education. My perfect table is on restaurant supply shelving with rollers topped by a 4′ x 8′ piece of plywood (3/4 ” thick, painted white and marked). For larger cuts, I use my hardwood floor. Since my company has taken over my home, I don’t need to worry about all this stuff getting in the way of my life. As for donations, I cleaned out years of spinning and weaving (including a production loom) by donating all to the local Waldorf school. They use all of it to teach weaving and knitting to the kids. Oh! No AC in your neck of the country this time of year? Ouch. We’re having a very cool summer here in MI this year but one trick I learned a few years ago is this: Use Vornado fans in your sewing room. Instead of just blowing air, they create a mini-tornado of air in the room. That circulates the air but it doesn’t displace papers, pattern pieces etc in the process. Because the air is constantly moving, you feel more comfortable. I’ve placed these fans around the house and in my bedroom (instead of a ceiling fan) and we actually lowered our AC consumption. Ours is gas, forced air heat and instead of that dead air feeling a bit before the AC kicks on, the feeling of flowing air is constant so you don’t notice the dead air part. Vornados do not cause stiff necks, backs etc like a occillating fan does. They have a website and the last time I checked, most of their product was made in USA. Of course, that could have changed. They have a floor model along with ones that will set on the floor. I think there is also one that can be wall mounted. Before you rework your lighting, check out the properties of the full-spectrum bulbs. One kind will give off enough heat to heat up your room and the other kind will keep the room at normal temperatures. Sorry I can’t be more specific – I’ve got to redo the lighting in my family room/sewing room and I’ll have to look up this information again myself. I may end up with summer/winter bulbs and change them seasonally. I’m always cold in the winter time and would welcome extra heat. I light up my sewing areas with the clamp-on type of light fixture. You can move and adjust the light where you need it. Check out some of those floor lamps with the light projected onto the ceiling. (There is a special name for them but I can’t recall how to spell it.) When you project the light up onto the ceiling it floods all over the room. When you add in lighting at special spots (like your machines) even they work better with out as much glare. Your eyes won’t get as tired if you do this. I don’t know how your room is designed, but Sam’s Club (and i’m sure other places) carry a commercial grade set of stainless steel shelving on wheels for about $100. These are what I’m using to replace our old stationary shelves in the basement. Promised Hubby if he got me those I would store my fabric on them instead of all these tubs all over the house. When you need to clean, you move the whole shelf. You don’t have to unload and then move them. When you put the shelves together you can adjust the height of the shelves to fit your needs. The shelves are not solid but stainless steel rods (like some closet units). They are STURDY and will take a lot of weight. I used the bed-raiser things to raise up my banquet table for cutting. I’m a bit taller than average (5’7″) and found the amount it raised the table was a bit too much for comfort. Depending on how the legs of your table are, your husband might be able to drill out some 4×4’s or 4×6’s to the exact height you need. You have to make certain that the table legs go down far enough into the lumber not to create a wobble. Your pieced tote was really pretty. It’s a simple design with elegance. The black velvet is gorgeous. My favorite is the blue leather. I love the color – and the leather looks so soft. It is versatile. I’d be comfortable using it when I would be dressed up or in jeans. I didn’t notice if you mentioned whether the tote had organizer pockets in it. If I were carrying a nice shopping tote like this I would like to put the necessities inside so I wouldn’t have to carry a purse. Nowadays, since I use a cane I prefer the over-the-shoulder purses so I can keep at least one hand free.